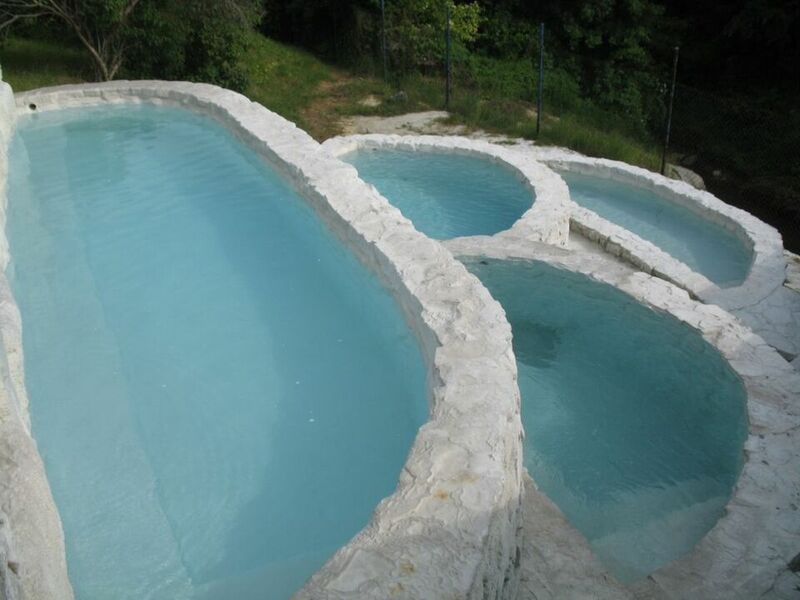 Thermal Swimming Pool Santovka Welness with geothermal water and beneficial impacts on rheumatic deseases and cardiac - vascular system is located 14 km from Levice. There are unique massage waterfalls, the natural stone showers and travertine baths also called the rome spa. Santovská geotermálna voda vyviera s teplotou 27 °C. Práve v jej prirodzenej podobe je v rovnováhe a priaznivo pôsobí na zdravie ľudí. Okrem plaveckého, rodinného a detského bazéna, sú hosťom k dispozícii 4 sedavé travertínové bazéniky v štýle tureckých „pamukkale“, v ktorých je celodenná cirkulácia termálnej vody. Vynikajúcim relaxom sú aj masážne travertínové vodopády a masážne trysky, ktoré vymasírujú a prekrvia telo pod prúdom termálnej vody napúšťanej priamo z prameňa. Súčasťou areálu je Petit hotel Santé** s celkovou kapacitou 32 lôžok, reštaurácia Santé s letnou terasou, ktorá má pestrú ponuku kvalitných jedál a nápojov a taktiež Slnečná terasa so špecialitami grilovanými priamo pred hosťom. The complex of rock dwellings squeezed in tuff rocks situated several kilometres east of Levice, in the village BRHLOVCE, is unique in the territory of Slovakia. Situated in the village of Hokovce and only 2 km from the Dudince Spa Town, Penzión Veperec offers accommodation in a quiet area with free WiFi and free private parking possible on site. Each room at Penzión Veperec comes with a TV with satellite channels, a fridge and a private bathroom with a shower or a bath tub. A common kitchen is also at guest disposal. You can engage in various activities, such as cycling and hiking. Located in the town of Dudince, Hotel Flóra offers a tennis court, free entrance to the pool with heated water, and free Wi-Fi in public areas. Spa facilities include saunas and a hot tub. All rooms have a balcony and a TV. Kúpalisko Dudinka sa nachádza v blízkosti kúpeľov Dudince. Leží v oblasti s mimoriadne teplou klímou v nadmorskej výške 140 m n.m. K dispozícii sú štyri bazény (s vodnými atrakciami, rekreačný, detský a minerálny). Situated 200 metres from the Dudince Thermal Spa, Penzión Gabika is a family-run guest house opened in 2011 and offering an on-site bar and rooms with hardwood floors and free WiFi. Featuring outdoor and indoor pools with mineral water, and rich spa area, Kupelny Hotel Rubin is calmly located in Dudince, and offers free shuttle service from the closest bus stops, 450 m away. Various spa and beauty treatments are available. Tourists like to visit the spa of DUDINCE lying on the foothill of the Krupinská kotlina basin. Its good position and warm stable climate contribute to the environment that offers relaxation, rehabilitation and therapy. t is the oldest spa house in Dudince. It started its operation in 1966 as the spa house Hont. It underwent a complete reconstruction that was accomplished in 2007. After Rubín, it is the second oldest spa house in Dudince. It started its operation in 1978. It is called after Emerald, the gem that is considered to be the gem of regeneration and recovery. Emerald strengthens heart, the whole immune system, helps with backache, lowers blood pressure and is told to bring household happiness and fidelity. Located in Dudince in the Banskobystrický kraj Region, 50 km from Dobogoko, LD Diamant Dudince boasts a seasonal outdoor pool and sun terrace. Guests can enjoy the on-site bar. Situated in the historical centre of Levice town and a pedestrian zone reachable within a 5-minute walk, Hotel Golden Eagle offers en-suite accommodation, a restaurant, a bar, a sun terrace, a garden, a 24-hour front desk and free wellness facilities. Free WiFi is available in all areas. If you wish to immerse in the star mysteries for a while, do not hesitate to visit the Tekovská hvezdáreň Observatory in Levice. You might be lucky to see trough the telescope a friendly extra-Terrestrial being waving at you. The Castle is the most important dominant of the town Levice. It is from the end of the 13th century. It stands on top of volcanic rock protuberance above the swamps of the Hron river. It was the sentry fort guarding the road leading to central Slovakian mining towns. Inštitúcia bola založená v Šahách v roku 1902 ako župné múzeum. Jej vznik iniciovala Hontiansko-župná múzejná spoločnosť na čele s Elemérom Pongráczom. Múzeum zaniklo v dôsledku zmien administratívneho členenia krajiny v roku 1924. Posledným kurátorom bol prvý uhorský olympionik Alajos Szokolyi. Znovuzaloženie inštitúcie ako mestského múzea sa udialo v roku 1992. Od roku 1995 funguje v dvoch budovách- na adrese J. Rotaridesa 13 (Hontianske múzeum) a na adrese Pivničná 1 ( Galéria Ľudovíta Simonyiho, predtým Hontianska galéria). Vineyards coat the environs of Levice. They are sprinkled with small houses and cellars called here hajlochy. Most of them are situated in the locality of Stará hora near SEBECHLEBY on the southern foothills of the Štiavnické vrchy Mts. The detached exposition of Tekovské museum in Levice – a mill settlement of former miller Pavol Turčan – lies at the Sikenica stream, appoximately 1 km from the upper (north) end of the Bohunice village. Featuring free WiFi, a barbecue and a sun terrace, Pivnica CSERNUS offers accommodation in Vinica. Free private parking is available on site. Each room at this homestay is air conditioned and is equipped with a flat-screen TV. Certain units include a seating area to relax in after a busy day. You will find a coffee machine in the room. Extras include free toiletries and a hairdryer. Superior rooms feature a spa bath or a hot tub. The area is popular for cycling and hiking. Dobogoko is 48 km from Pivnica CSERNUS, while Dudince is 18 km from the property. The bulky fortified Benedictine monastery, one of the oldest and most important architectural monuments of Slovakia, stands on the rocks above the village Hronský Beňadik south of Nová Baňa. Ruins of the Čabraď Castle are in the Krupinská planina plain in south of Slovakia. The village of Bíňa in the south-east of Slovakia is one of the most important archaeological sites in Slovakia.